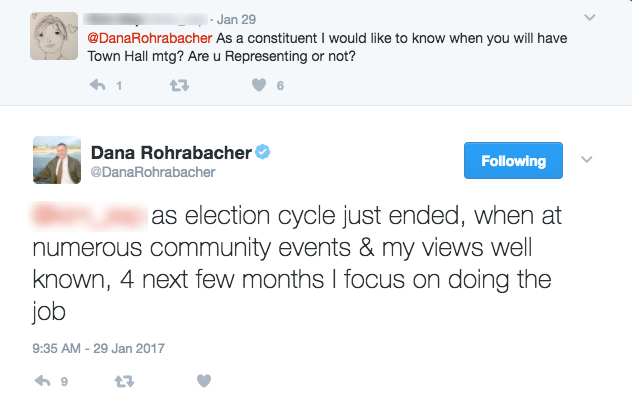 Like many of my fellow District 48’ers, I’ve been calling on Representative Dana Rohrabacher to hold a town hall meeting. 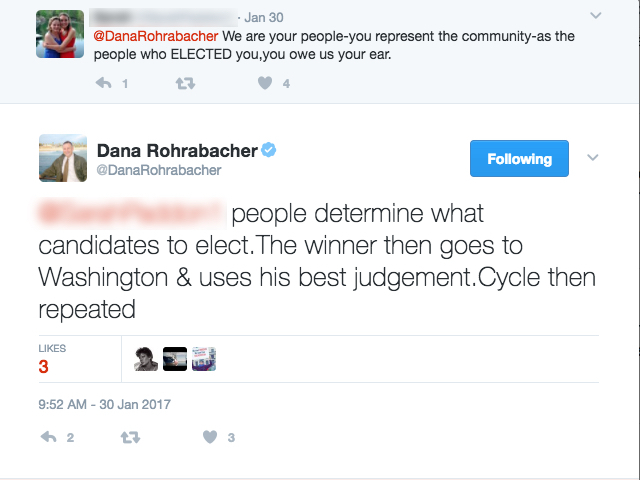 He writes his own rules, such as, constituents are only allowed to talk to their potential representative during the election cycle. Well, wouldn’t you know it? He’s already filed paperwork declaring his candidacy for 2018. 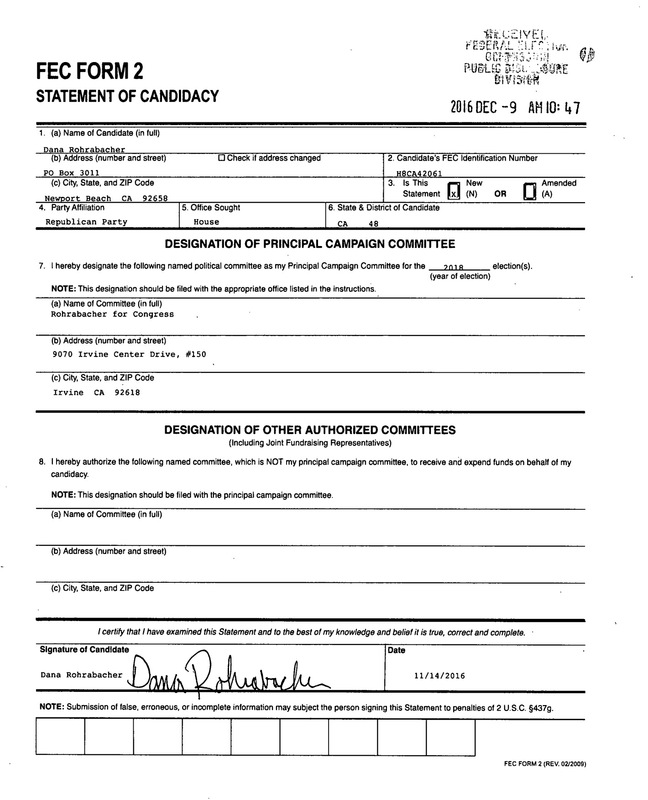 He’s been a candidate for the 2018 race since November 14, 2016. Based on what he said, we are now allowed to speak to him. Yet, he seems to have forgotten that. Probably because it doesn’t fit into his current narrative of how he sees the opposition. 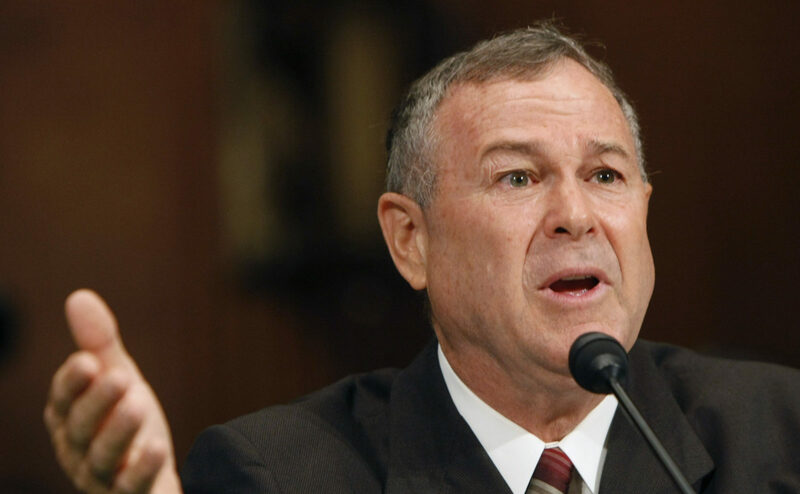 “… this Tuesday, as a 2-year-old girl slid a valentine under the door on Tuesday, one of Rohrabacher’s staffers opened it, hitting her in the head and knocking her to the ground. “According to local reporting, one of the constituents then grabbed the door and tugged on it, causing 71-year old district director Kathleen Staunton, who was on the other side of the door, to lose her footing and fall. A spokesman for Rohrabacher’s office told media that she later fell unconscious and had to go to the hospital. “Officer Jennifer Marlatt of the Huntington Beach police department characterized the incident as an accident, and denied that she was transported to the hospital. No further details have been released on this employee’s status. I know I’m not alone in wishing her a speedy recovery from this accident. Also, the child on the other side of the door is fine. It should be noted the HBPD have not made any arrests in connection with what took place. WOW. We have a ton of power, and thank you Rep. Rohrabacher for reaffirming it. Why else would he attempt to control the public narrative with such an overreaction? Something the police – who were there – didn’t seek to arrest anyone involved on either side of the incident. What this press release shows is that we’re getting to him. 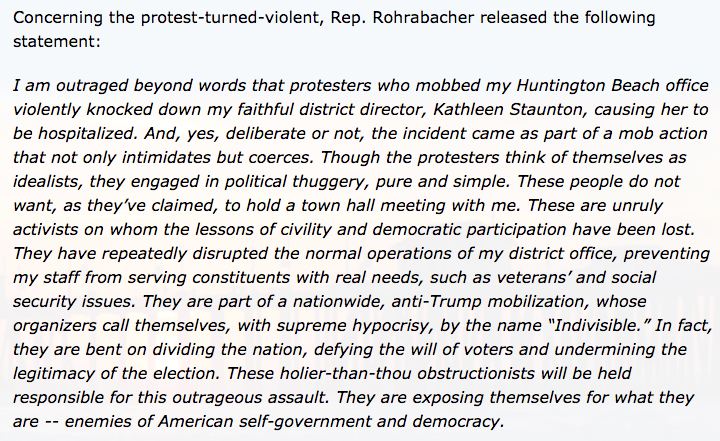 Rep. Rohrabacher has grown far too comfortable with the fact he’s had a relatively passive district for many years. Now he’s feeling the heat. It’s a fine line we walk here as the Resistance. This is especially true in District 48 where he have some of the richest citizens in Orange County. 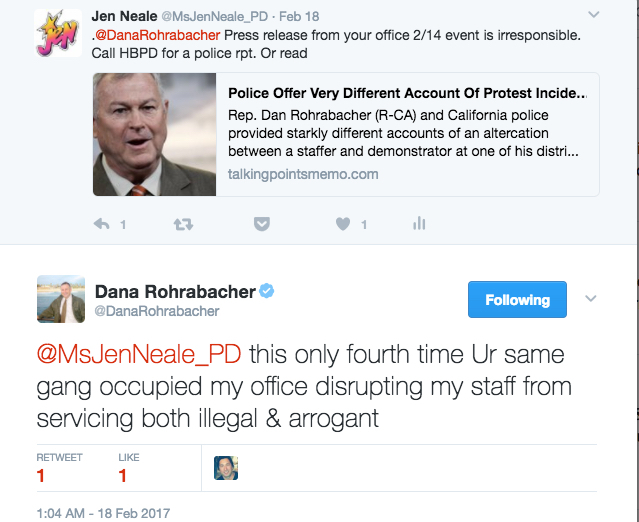 They’ll buy into the hype Rep. Rohrabacher sells as long as there are negative incidents for him to cling to. He’s baiting us to come at him with threats and insults (in person and on social media) so he can paint us as an unintelligent group of bullies making his life difficult. That’s not who we are. We control the narrative when we give him nothing negative to grasp at. I’m reminded of a quote by Captain America from Avengers: Age of Ultron. Dana Rorabacher is our Ultron and we are the Avengers. I know it sounds silly but let’s replace a couple words in Captain America’s speech. Be the good we want in the world. Be better than him. When one believes so strongly about something, it’s easy to get caught up in only our side of the facts. We listen to people who agree with us and automatically look to discredit those who don’t. I am guilty of this daily. Take a minute when having a discussion to make sure you’re considering all sides of an issue. Try to see the other person or group’s point of view. It’ll help you craft a better message in the long run. Jen Neale is a resident of Costa Mesa. She’s a paid sports journalist, and thanks to Donald Trump, is now an unpaid political activist. 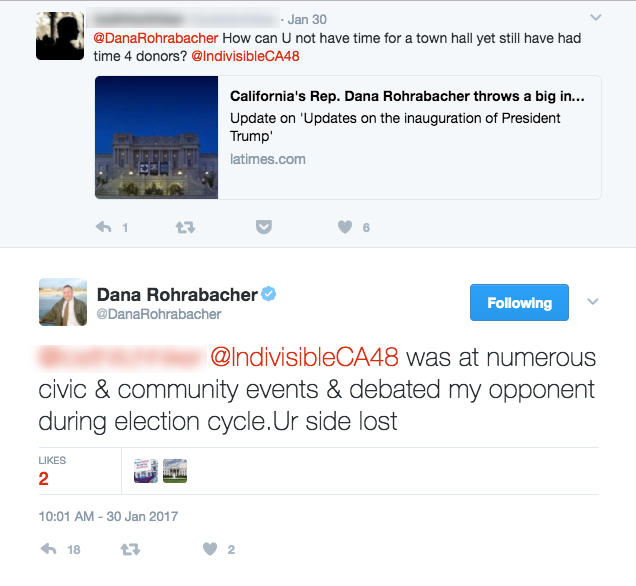 In addition to making phone calls, sending emails and attending protests, writing a blog for Indivisible OC is how she adds to the #Resistance.